The Guardian has a top article this morning on ways to save money and cut carbon, featuring advice from SaveMoneyCutCarbon.com CEO Mark Sait. The feature asks: “Want to save energy, slash your power bills and reduce your carbon footprint? Of course you do – it’s a no brainer.” The “how-to” is provided by Mark – ways to overcome the challenges facing households, companies and organisations. As Mark says: “Ultimately for any of our customers, big or small, it’s about making sure they see a reduction in their bills equal to or greater than we calculated. A savings calculator is linked to all the products on the savemoneycutcarbon.com website, and calculates potential savings immediately. 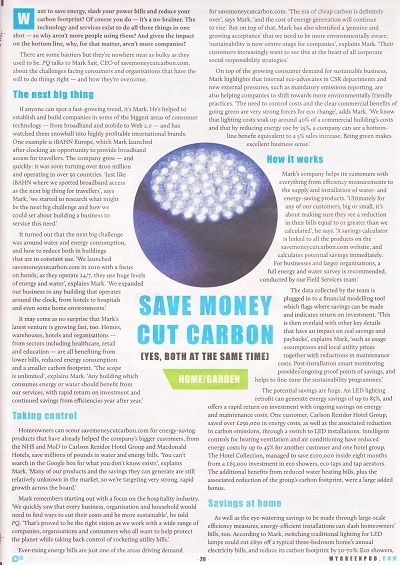 Read “Save Money Cut Carbon – Yes, both at the same time”.